I love slippers: from the fair isle, leather-soled versions I've seen in stores lately all the way back to my big poofy Steve Madden muppet slippers, there's nothing more cozy than a good pair. 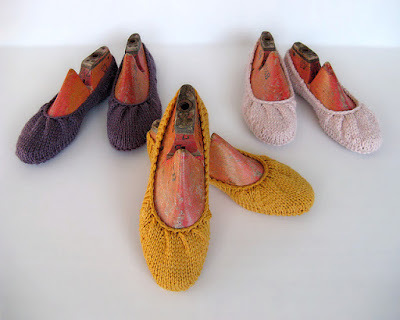 There are a TON of great knitted and felted slippers, but I want to focus on a very specific type for today: non-felted, ballet-style flat slippers. I've had Julie Wiesenberger's Pleated Ballet Flats in my queue for ages. I love the subtle gathering around the opening, which makes these a great candidate for a simple, luxe yarn. I'd make some for myself, and then a bunch as gifts. Jade Lee's Seamless Slipper pattern is affordable and adorable, with a different look that presents an opportunity for buttons! Okay, you know the rules: favorite slippers in the comments!